For the past four decades, the veterinarians and staff at Arlington Park Veterinary Hospital have provided complete veterinary services to dogs; cats; rabbits and small animals such as guinea pigs and gerbils in the northwest suburbs and beyond. We provide medical, diagnostic, and surgical care of companion animals; boarding; grooming; dog-training classes; geriatric services; and stem cell therapy. We are committed to providing the highest quality of medical care throughout your pet’s lifetime. Arlington Park Veterinary Hospital is recognized as one of America’s top veterinarians in consumer surveys of Chicago-area veterinary practices and has consistently been given top ratings by national consumer research groups. Call today to schedule an appointment. Compassionate care makes all the difference. We are passionate about providing excellent care for all pets. 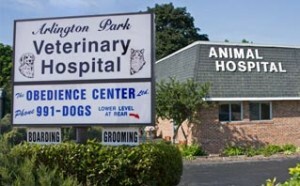 Arlington Park Veterinary Hospital serves Arlington Heights, Palatine, Rolling Meadows and surrounding communities. The veterinarians will make house calls within the immediate geographic area. Call us for information.